We are officially five months in wow! I seem to be amazed by the passage of time because I say this every month. 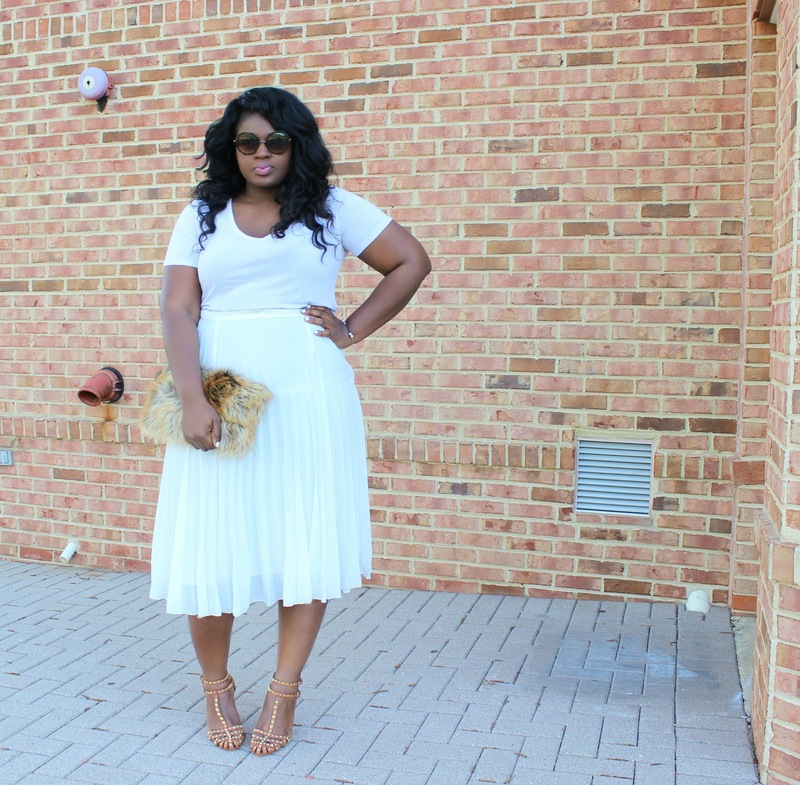 If it isn’t obvious I’m trying to get in as much white as I can before Labor Day (you can check out my last all white post Here it’s my most viewed post till date) . White can be a scary color to wear, and has gotten a bad wrap over the years. However it’s one of the bigger street style trends this spring and why not the color is fresh,youthful and looks breathtaking on warmer skin tones. Everyone can wear white, and here are a few tips to keep in mind when wearing white; fit is king when wearing white you want to aim for pieces that are slim not tight. 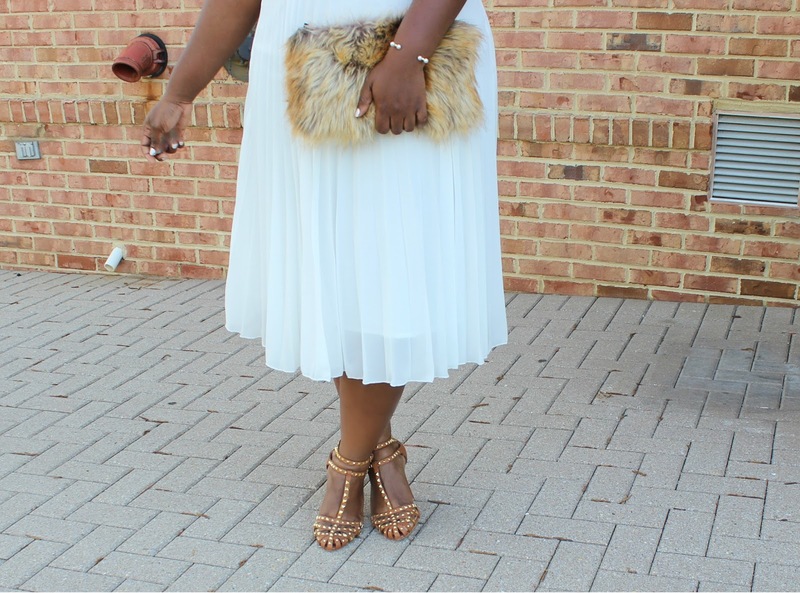 When wearing all white try different textures (silk, jersey, brocade, fur, leather, and linen, your options are limitless), match your whites (some whites don’t go well together), and add neutral pieces (like I’ve done here, it helps break up the look and it’s one less thing you have to worry about getting dirty!). 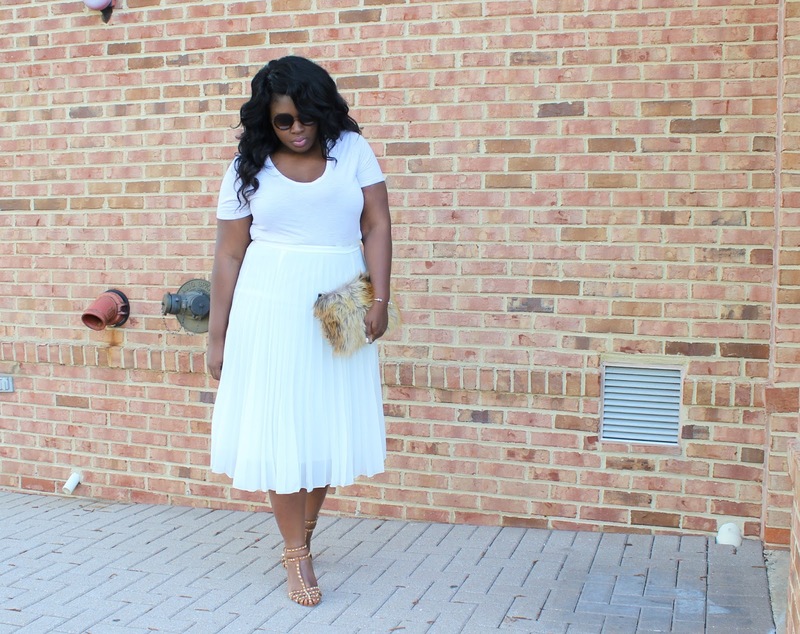 The focal point for this look is this White Pleated Skirt ( Eloquii has some great skirt options, like this Rihanna inspired One). 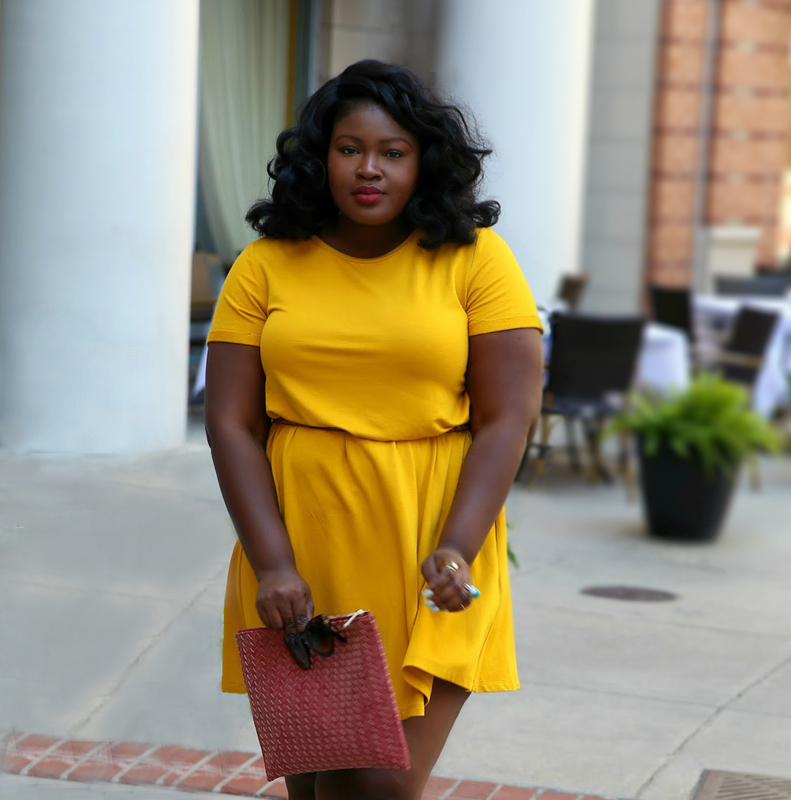 I absolutely love the color and the pleating, I used my accessories to add texture, I chose my studded Sandals from Zara and keeping up with the neutral theme my Fur Clutch from Asos (I figured she got her much needed break from the blog see how I’ve worn her Here, Here). I love my Zara sandals they are feminine, edgy and they go with everything unfortunately they are old ( see similar Here). I styled the Skirt with a fitted Tee (remember proportions). 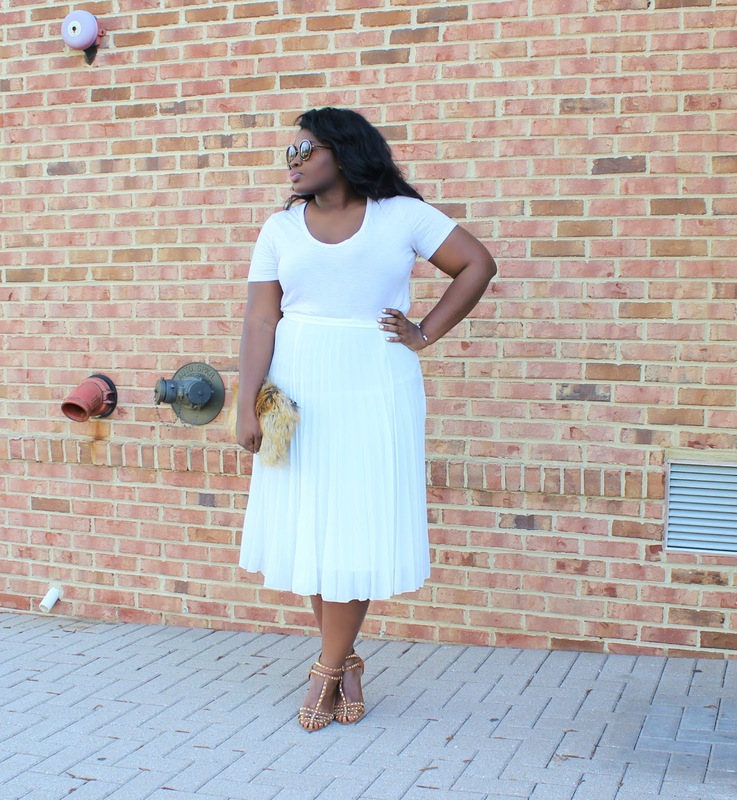 All White is not for the faint of heart (I know this because by the end the day I had like three stains on the skirt that I could not for the life of me place how they got there) but I hope these tips will help you be more comfortable wearing white. Have you tried all white? Did you make it through stain free?